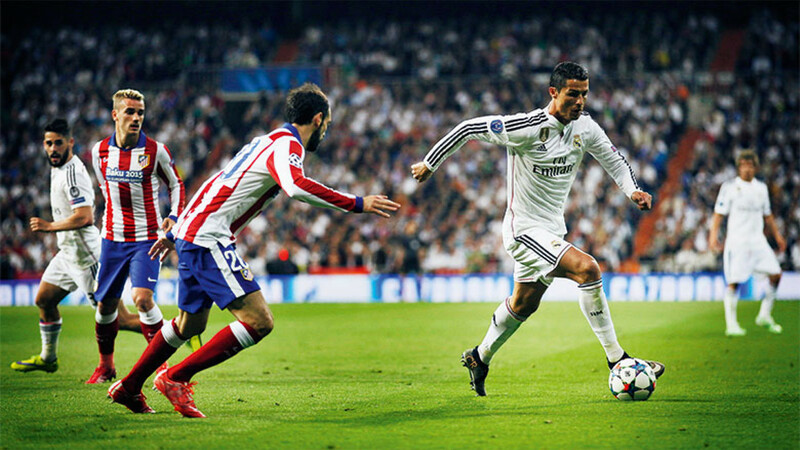 Atleti players try and hold off Real Madrid's Cristiano Ronaldo in a recent match between the two sides. It's a clear February day in Madrid, and I'm looking on as a 20-year-old named Saúl Ñíguez changes a small but hugely significant part of the identity of the city, with one acrobatic twist of his leg. 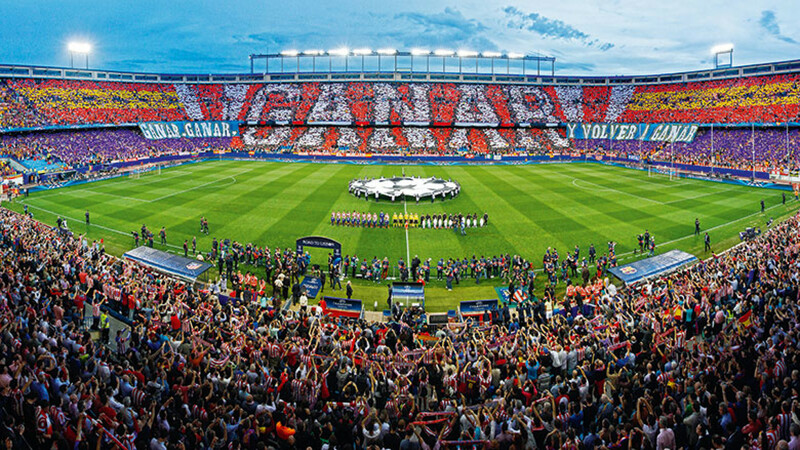 The venue is the Vicente Calderón stadium in the south of the city, home to Atlético Madrid football club. My seat is up in the gods, and I'm watching on as, a few moments after Atlético Madrid take an surprise early lead against their arch-rivals Real Madrid in a fiery local derby, their influential midfielder Koke is stricken with injury. Koke has to be substituted, so Saúl, the young Madrilenian, enters the fray. What happens next is one of those football stories. Atleti fans are packed into the cracked concrete amphitheatre, smoke from smuggled joints and the smell of popcorn in the air. For Real Madrid, Cristiano Ronaldo is visibly furious; Gareth Bale is trying all he can but is ineffective. Atlético's Guilherme Siqueira receives the ball, advances down the left wing towards the touchline and chips a floated cross just behind Saúl, whose reaction is to abruptly turn his back towards the goal and cannon the ball off the left post and in with a fantastic bicycle kick. It isn't his first appearance for the club, but it is his first goal, and a vital one at that. Two more follow in the second half, but realistically the game is won at the moment Saúl makes it 2-0. The Atleti fans are roaring and jubilant by the time the third and fourth go in, and when the crowd spills out of the old stadium and we join them on the way back to the city centre, they're clearly thrilled that, for now at least, the town is painted red and white. Saúl is the jewel in the crown of a performance that gives Atleti their biggest win over Real Madrid since 1987, and one you could argue finally convinces Spain's football community – whom Atleti had already stunned with a miraculous league title the year before – that their city rivals can not only be beaten, but outclassed. At 20, the man of the match is already firmly entrenched in Madrid's football culture, having represented all three of its major clubs – Real, Atlético and the suburban Real Vallecano on loan – already. Released from the hyper-competition of Real Madrid's youth team system at 14, he jumped across the divide to the Vicente Calderón stadium, where he found progressive coaching, a patient youth team setup and, much to Real Madrid's chagrin, the platform on which to become a figurehead in his hometown. That city, Madrid, is unquestionably a footballing one, and that fact is evident everywhere: in the winding backstreets surrounding La Plaza Mayor I find a tapas bar where a blinking TV churns out coverage from late-night matches elsewhere around the country. I stop to grab a vermouth and chat in (admittedly broken) Spanish to the owner, a Real Madrid fan. These are Real/Atleti borderlands – parts of the city with no real adherence to one club over the other, where even members of the same family aren't always guaranteed to share an allegiance. 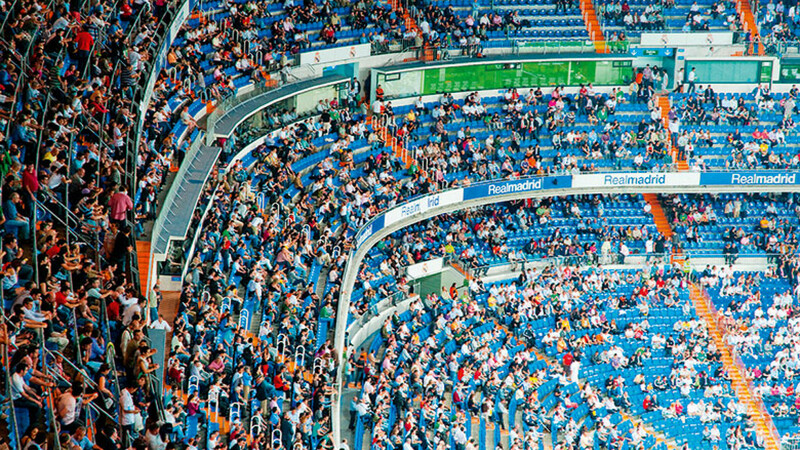 Interested in the way finances, rivalries and politics shape Spanish football? No one covers it more extensively than Sid Lowe in his book Fear and Loathing in La Liga: Barcelona vs Real Madrid. As well as going in-depth into one of the most famous rivalries in football, it also describes how the Spanish civil war shaped the Spanish teams of the modern era. But if Madrid's central backstreets are split, the divide between the two teams is overwhelmingly apparent on the approach to Atleti's home in the city's Arganzuela district, which is surrounded by partially crumbling apartment blocks, rebel yells and the smell of wet concrete in the air. It's a bracing entrance to a clanking, rickety stadium that feels like a relic from a bygone era of football – shirts are worn not just with pride, but something approaching tribalism. And the difference is equally apparent in both of the districts surrounding the Vicente Calderón and Real Madrid's 85,000-seater stadium, the Santiago Bernabéu – which is in the thick of La Castellana, Madrid's banking district and home to the city's only real crop of glass-walled office buildings and multi-storey skyscrapers. "I asked a Real Madrid fan what he thought about it once," Madrid-based journalist and Spanish football expert Sid Lowe tells me, "and he said 'It's caviar and cocido.' – this idea of the most refined, brilliant football against this hearty, but perhaps a bit gristly, club – in social and political terms, as well as footballing ones." Most major footballing cities are home to a frontrunner and an underdog – in England, Liverpool have historically dominated while Everton have toiled for smaller rewards; in Manchester, only an eye-watering influx of cash has catapulted Man City to parity with United – and in Spain, it's even harder, with the money from TV rights stacked enormously in favour of its top two clubs, Real Madrid and Barcelona. It's the reason why the tribal roar from the Atleti fans rings so loudly through the air before, during and long after this trouncing of their more illustrious neighbours. A tour of the Bernabéu the next day brings it home to me personally. With the dust settled, we arrive by taxi for a tour of the stadium, before stepping out for a bite to eat at a trendy feeling tapas restaurant in the thick of the malls and towers. It's a far cry from the grit and gristle of La Arganzuela and the Vicente Calderón – and it explains the reason why Lowe describes Atlético Madrid's 2013-14 La Liga win as "possibly the biggest achievement there has ever been in Spanish football". But for all the love of a great underdog story, Real Madrid's history and grandeur is equally thrilling to me. Walking around the beautiful stadium, especially its seemingly neverending trophy room, you can feel the weight of a club whose gigantic profile typifies the reason why football is the world's best-loved sport. They're a colossus, one of the world's true sporting giants, and everything about the stadium – from its location to the almost cinematic, panoramic view from the touchline – rams home the point. There's a reason that Lowe tells me, "in terms of media coverage, in terms of finances, in terms of the players they've got, every single season is about Real Madrid and Barcelona – even when it's not." Skip forward three months, and Real Madrid end up finishing the season 14 points better off than their neighbours, who may not for decades emulate their mammoth feat in 2013 due to the barriers stacked against them, but who are still closer to it than almost any other time in their history. Real Madrid, in turn, end up losing out to Barcelona in their pursuit of their 33rd championship win. There were to be no victory parades in Madrid last summer. Real Madrid's vaunted stadium, the Santiago Bernabéu, is one of the biggest in Europe, with a capacity of almost 90,000. It may feel older than its Real Madrid counterpart, but when it's rocking, the Vicente Calderón is a cauldron. So what next? It's clearly superb for Madrid as a city to have two genuinely top-class football clubs, and, having immersed myself in both clubs, and seeing for myself how happy it makes Atlético fans to claim the city for themselves, if only briefly, I think two clubs work perfectly as they are. They each reflect, in their own way, the things we love about the sport – the graft and the grandeur; the hard-earned honour and the effortless opulence – as well as the vibrancy and intrigue that football brings to a city that's as captivating as Spain's capital. But Atleti have been rumoured, in the decidedly unromantic terms football sometimes operates in, to be moving out of their home in the south of Madrid, where they're generously represented by their fans, into a shiny new one further afield. Online football trip specialist footballbreak.co.uk offers fully customisable, ATOL-protected football trips to see top European fixtures in Spain's La Liga, the German Bundesliga, Italy's Serie A and France's Ligue 1. Packages include guaranteed match tickets seated together; accommodation; return flights; plus a wide range of optional extras. "To move to the north-east – which is kind of airport, business territory – for a club so conscious of its identity, I think it could really damage them," Lowe tells me. Unfortunately, in football, money talks. At least Lowe himself doubts the imminent reality of a move that's been seemingly on the brink of occurring for years. Real Madrid fans are happy to trek out to the glass towers of La Castellana to watch their team – it's a fair price to pay for supporting a club whose profile and corporate identity makes them the best-known in the world – but to think that in the near future, you could go to an Atlético Madrid home game and miss that descent into a rougher but equally noble place – one that seems so suited to the team and the fans it houses – seems unthinkable. As for Saúl, the player who vanquished the club that chewed him up and spat him out as a youngster? He's done what he had to and found somewhere he's loved, surrounded by positivity, and where he'll presumably stay for at least a few more years. I just hope that Atlético can do the same.